Complete these forms only if admitted to the school of nursing, or entering the professional phase of schools of pharmacy and health sciences. Students have access to the Health Service Student Portal through DORI. Access the Portal by using your multipass log in, select STUDENT from the drop down options under "Go To", and then select "Health Service Student Portal" (Follow instructions in portal). Through this portal, health history and immunizations can be submitted and hard document copies uploaded for easy verification by health service staff. 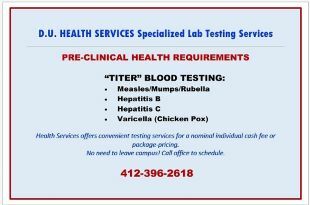 Blood "Titer" testing can be obtained at DU Health Services by appointment. Call 412-396-1650 or 412-396-2618. Required immunizations can be obtained at the DU Center for Pharmacy Care at DU Health Services by appointment. Call 412-396-2155. All Pharmacy prior to their professional phase (generally 2nd to 3rd year)students should review the form as they must meet the additional requirements listed on it. Please open and complete forms, then upload to the Health Service Student Portal. Nursing (UNDERGRADUATE ONLY) Students should review the form as they must meet the additional requirements listed on it. Nursing (GRADUATE ONLY) Students should review the form as they must meet the additional requirements listed on it.